Has the missing Imperial Easter Egg Surprise for the 1907 Rose Trellis Egg recently been identified? I think yes! Follow me on this extraordinary journey! Fabergé Egg enthusiast Greg Daubney contacted me earlier this October 2017 to show me a photograph of Empress Alexandra wearing a chain he thought could be the missing surprise to the 1907 Imperial Easter Egg. My heart missed a beat and I just knew he found it! Below is the photograph Greg showed me and I quickly found out the photo was taken during the Imperial visit to Reval (now Tallinn, Estonia) in 1908*. So the date was ok! I searched the internet for photographs of the Empress and the heir and I was convinced this was the missing surprise to the 1907 Easter Egg! 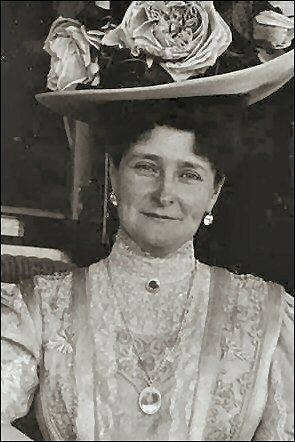 The Empress in 1908 wearing a medallion she received in 1907, depicting her child as it was photographed in 1906. How many medallions of her son could the Empress have?! ---> The surprise as outlined in the original Faberge invoice of 30th April 1907 was a 'diamond chain with medallion and miniature of HIH Grand Duke and Tsarevich Alexis Nicholaevich'. While searching the internet I found an image of Alexandra Feodorovna in June 1908 wearing a chain and medallion which piqued my interest. See Photo Alexandra Feodorovna above. An enlargement shows the medallion in more detail (below) and I believe for a number of reasons this could well be the missing surprise. 1) Timing of the photograph would fit, with Alexandra having received the medallion the previous year as part of that years Faberge Egg. 2) Kieran McCarthy believes that The circular loop above the oval pendant is highly characteristic of the firm’s jewels and it must be by Fabergé. It also contains an image of a child that might be the Tsarevich and therefore there is chance it is the missing surprise. 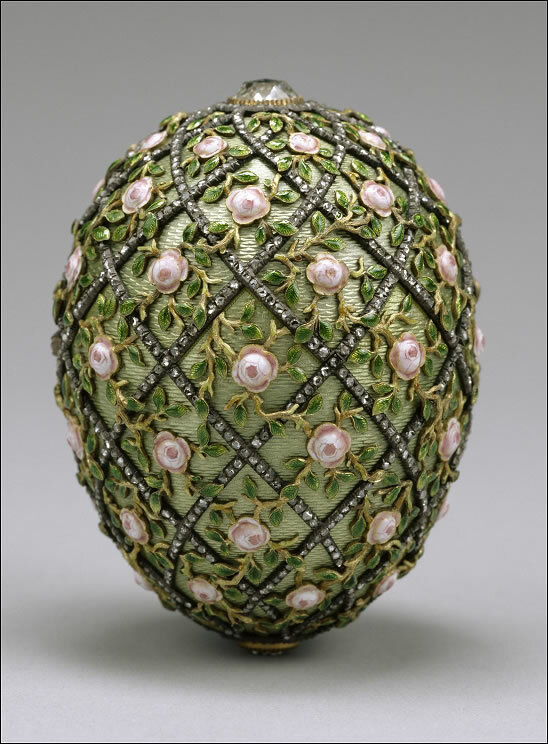 3) If the medallion does contain an image of the Tsarevich then it would probably be from around mid-late 1906, as I understand the approximate production time of each Egg was approximately 12 months. 4) I found on the internet an official photograph of Alexis Nicholaevich which was dated 1906 and appears to be part of a larger set showing all the Imperial Children (See above Alexei 1906). 5) Comparing the official photograph with the fuzzy image on the medallion I was struck by several similarities: The bow on the right shoulder, the line of the hair against the forehead. 6) As an image of arguably her favorite child, surely its something Alexandra would have wanted to wear, and what better occasion than the visit of the British Royal Family at Revel in the summer of 1908 where the photograph was taken. With the help of a good friend, I have created a set of transitional photos where the Official 1906 Alexis image is overlayed onto the portrait image on the medallion. See 'Rose Trellis Egg Surprise' below. Some questions remain as to the composition of the necklace, whether it is diamonds or pearls or perhaps a combination of the two? 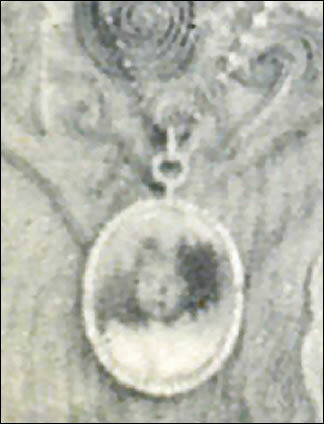 There are several photographs of the Empress wearing the medallion on that same trip. British Queen Alexandra made a photo album of the trip that you can admire in the Royal Collection. Catherine de Guitaut was as nice as ever when she shared the photograph of the Empress for our research. The whole album compiled by Queen Alexandra you can admire here! As I later found the album elsewhere online, I did not use the Royal Collection photograph but my thanks are just as big! Photos of the Imperial children can be seen and compared on this page. The photos are listed per year so look for 1906 to see what Alexei looked like in 1906 when his portrait must have been painted for the medallion. 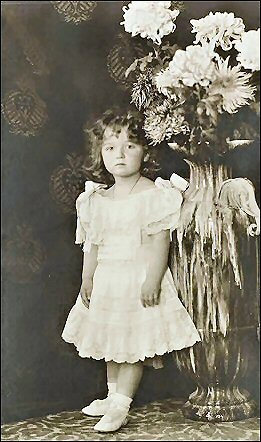 And in case you think you see only girls, Alexei is the youngest child, but dressed like a girl as was customary in those days. Until a certain age, male children were dressed this way. Want to know why, click here! Now you undoubtedly want to know if the medallion would fit into the Egg and know that Greg and I just as much would like to know. The medallion unfortunately is still lost so we cannot travel to the museum to try a fit. 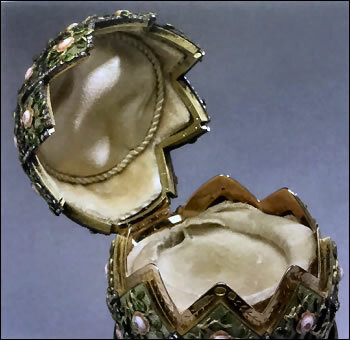 And just as I was making this page, my friend and Fabergé scholar Ulla Tillander-Godenhielm sent me a photo of the opened egg showing the space for the lost necklace, writing "It did not lie inside the egg for long as there is no impression of it on the lining. The empress surely immediately hung it across her neck". As we Imperial Egg lovers know, nothing is impossible when the Eggs are involved and this identification of the surprise may lead to much better things, as we now know what to look for! 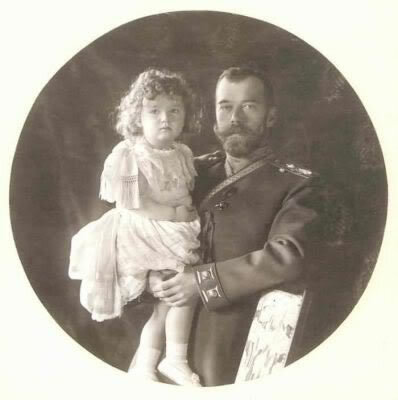 From the same photo shoot, Emperor Nicholas II with Alexei the heir, photographed in 1906. This visit was the historic meeting between King Edward VII and the Tsar of Russia, in the waters off Reval (now Tallinn, Estonia) in June 1908, marking the first official visit of an English monarch to Russian waters. Read all about this meeting in this New York Times report published June 10, 1908. For all missing surprises and Eggs, click here!